Did This Tuner Make The Wrangler More Awesome Or Insanely Ugly? Take a closer look before you decide. When Miami based auto tuner MC Customs got its hands on a new Jeep Wrangler, it went to town on the rugged off-road vehicle and turned it into the ultimate “Bling Machine.” The specially tricked out Jeep looks something like a mutant off-road lowrider complete with stark white paint heavily contrasting with the black tinted windows. 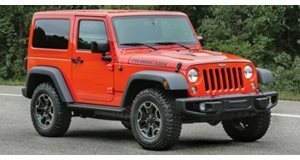 The most noticeable addition to the Wrangler is the set of 5 blue-accented 24-inch Vellano wheels wrapped in chunky tires. Other notable changes include blue-accented hood and side vents as well as a modified reinforced front end with a new grill and blue tow winches.The special wrangler also has a mean high intensity light set up lining the windshield and the ride height has been noticeably raised to give the car an intimidatingly tall stance. Depending on your taste in cars and customizations the look of this blinged out MC Customs Jeep Wrangler could range from extremely tacky to downright awesome. What do you think?